Common and his mother Dr. Mahalia Hines with teachers from P.S. 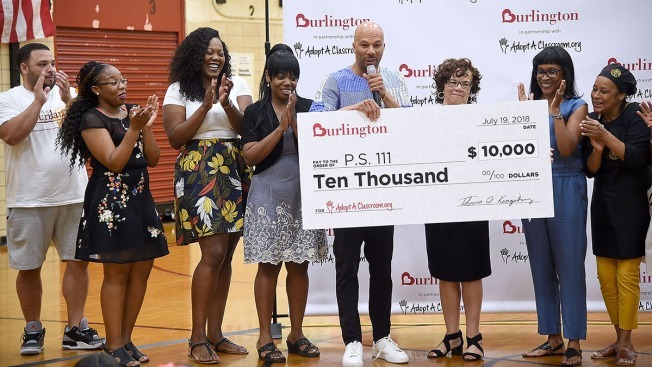 111 visit NYC elementary school for Back-To-School fundraising with Burlington Stores and AdoptAClassroom.org on July 19, 2018 in New York City. Common shared his love of writing, and even recited the lyrics to his acclaimed hit, "Black America Again"
Rapper Common has won three Grammys, a Golden Globe and an Academy Award but a recent visit to a New York City school was "humbling" — mainly because many of the students were too young to know his music. The award-winner showed up at P.S. 111 in midtown Manhattan on Thursday as an ambassador for the Adopt-A-Classroom initiative. He made the surprise appearance with his mother, Dr. Mahalia Hines, to present the school with a $10,000 check. While Common has a diverse fan base, it probably doesn't include many fourth and fifth graders. He joked about their reaction when he was introduced. "The kids they were looking like, 'Who is this dude? We don't know him.' But I'm still just here to connect with children, and connect with the people and our teachers. So, I felt that it was more fun. It is humbling, but it is fun to try and get them to pay attention," Common said. According to Adopt-A-Classroom, 96 percent of teachers nationwide bear the cost each year to equip their classrooms with the basic materials students need to learn. The organization estimates that teachers spend more than $700 out of their own pocket each year. The program provides funds for teachers to purchase school supplies. After addressing the students in the school's gymnasium, Common went upstairs to visit a classroom. He shared his love of writing, and even recited the lyrics to his acclaimed hit, "Black America Again." "When I saw the kids I really was just trying to let them know we were here because we care and that we value them and that they have the world at their hands," he said. For the second year in a row, Adopt-A-Classroom has partnered with Burlington Stores. Shoppers can make a $1 donation to the organization at checkout through Aug. 18.